HUNTERSVILLE, North Carolina (July 17, 2018) – The National Basketball Association has had a number of trios dubbed “The Big Three” who have worked together to bring home NBA championships this century. First to come to mind is the heart and soul of the San Antonio Spurs – Tim Duncan, Tony Parker, and Manu Ginobili – who brought the city five NBA titles starting with their first together in 2003 and the last one in 2016. Causing havoc during the Spurs lengthy reign was a dynamic run by the Miami Heat, featuring the trio of LeBron James, Dwayne Wade and Chris Bosh. They battled the Spurs for championships with four straight NBA finals appearances from 2011 to 2014, topped by back-to-back titles in 2012 and 2013. 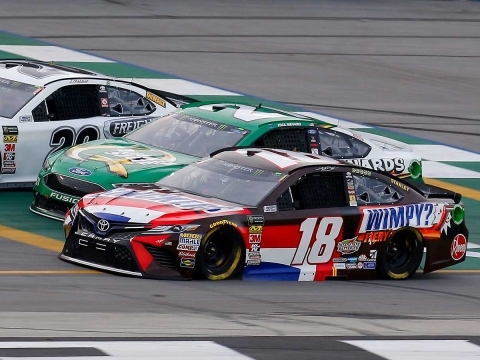 This year, the Monster Energy NASCAR Cup Series has developed quite “The Big Three” of its own, even though they represent three different teams. Kyle Busch, Kevin Harvick and Martin Truex Jr. have combined to win 14 of the first 19 races of 2018. While Busch and Harvick boast five points-paying wins apiece, Truex was the most recent winner of the trio by dominating Saturday night’s race at Kentucky Speedway in Sparta to up his win total to four on the year. 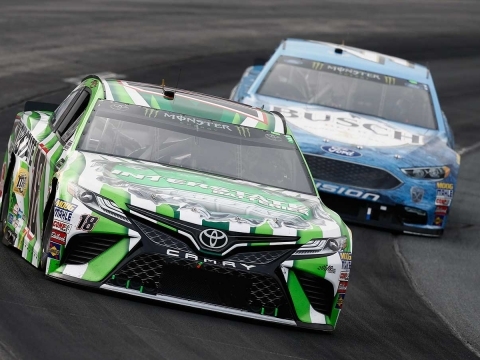 As the NASCAR Cup Series heads to its next stop on the tour – New Hampshire Motor Speedway in Loudon for Sunday’s Foxwoods Casino Resort 301 – Busch is looking to continue the torrid pace by “The Big Three” by adding yet another notch to the win column at one of his most successful tracks over the year. The track known as the “Magic Mile” has certainly lived up to its billing for Busch, driver of the No. 18 Interstate Batteries Toyota for Joe Gibbs Racing (JGR). In 2015, he and his team used hard work and a little bit of luck at the 1.058-mile oval to bring home what would be the second of three Cup Series wins in a row during a summer hot streak that would ultimately springboard him to that year’s Cup Series championship. After winning the previous week at Kentucky, Busch, crew chief Adam Stevens and the entire Interstate Batteries team were shining examples of Interstate’s slogan of “Outrageously Dependable” at New Hampshire. It looked like their race was ruined by an unscheduled pit stop on lap 244 that dropped them to 20th after running in the top-three all race long. But, just as quickly as misfortune struck, good luck followed. Busch hustled to get by leaders Brad Keselowski and Harvick and, just as he did that, the caution flag flew. While the rest of the leaders needed to pit for fuel, Busch had already made his final trip to pit road. He was able to hold the lead for the final stretch of the race for his second consecutive victory, then added another memorable win the following week – the prestigious Brickyard 400 at Indianapolis Motor Speedway, where he also won in 2016. The 2015 New Hampshire victory was Busch’s second Cup Series win at New Hampshire, the first coming in just his third start there in July 2006 and in dominating fashion as he led 107 laps. After that 2006 win, the Las Vegas native left with plenty of confidence that he could get multiple wins at the “Magic Mile” as his career progressed. As it turned out, he was winless there over the next 17 races, which included a number of near-misses. The driver of the Interstate Batteries Toyota posted five top-five finishes in those 17 starts between New Hampshire wins, including three runner-up finishes in a row in 2013 and 2014. In all, Busch has 10 top-five finishes and 14 top-10s in 26 starts at the track. So, as NASCAR’s top series heads to the Northeast for Sunday’s 301-mile race, Busch will look to rekindle the magic he last enjoyed during this time of year in 2015. There will be plenty of Interstate Batteries distributors and dealers across New England cheering him on as he looks to be the latest of “The Big Three” to keep up the torrid start to the season for the three clear championship contenders. Will the racing be different at New Hampshire Motor Speedway, since it’s no longer part of the playoffs? With the big three (Busch, Harvick and Truex) running so well, what do you have to do to get that edge over those guys and get your second championship this year? In the July race you won at New Hampshire in 2015, you had to pit later in the race because you thought you had a tire going down. What do you remember about that race? What does it take to be successful at New Hampshire? The New Hampshire race is one of the shortest on the circuit. How do you approach that race knowing you might have a little less time to get to the front at the end? When you make a mistake at Loudon, does it cost you a little bit more because you have less time to recover?